Our main profile is to provide horse riding and horse riding instruction for adults and children, from seven years of age and older, from beginners to decent riders We offer from half an hour trainings on lunge to 2-3 day ride outs as well. All of our tours are guided! 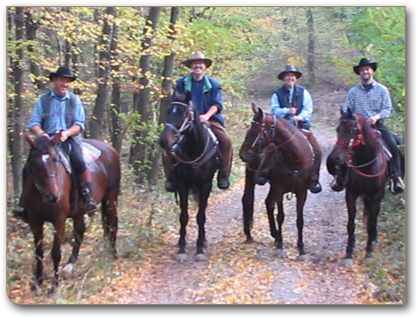 Those who would like to have a ride back through the ages without being in the saddle, there is the possibility to driven and around the village or have a trip in the surrounding forests. During the day there is the option to either take a break and taste some of the regions excellent wines or after the ride we welcome our guest with authentic Hungarian Gulash, wine and pasteries. 1 hour coaching, after party with wine and gulash: 12€/person. -Return tour to the medieval castle of Sümeg with dinner on the first day– 4-6 hours in saddle per day – over night in the pension, with to and from organised by us. -Tour around the Valleys of Tapolca with the aim to reach Nemesgulács – 4-6 hours riding per day - over night in the pension, with travel to and from organised by us. All the tours can be combined on request and there is the possibility for longer outings too.